The EPO and the China National Intellectual Property Administration (CNIPA, formerly SIPO) have agreed on a co-operation programme for next year as part of their long-term strategic partnership on strengthening the patent system. 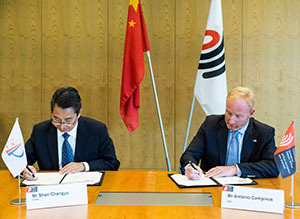 The 2019 co-operation work plan was signed by EPO President António Campinos and CNIPA Commissioner Shen Changyu on Friday at their annual heads of office meeting in Munich. The plan focuses on areas such as patent law and patent examination guidelines, examination quality, data exchange, classification, search tools and machine translation, and also foresees a joint study on computer-implemented inventions. It falls under the framework of the comprehensive strategic partnership agreement signed by the EPO and the Chinese office last year - the first such agreement between two major patent offices. "The partnership with China is of paramount importance to the EPO," said EPO President Campinos. "I am very pleased to have my first official meeting with Commissioner Shen to discuss how we can further improve the patent system to better serve users in both of our regions. By continuing our co-operation and close consultation also with Chinese and European industry, we strive to enhance the quality of our patent-granting procedures in order to improve the efficiency and effectiveness of the global patent system," he said. Mr Campinos added: "Our offices will look at strengthening co-operation on inventions related to new technologies such as artificial intelligence, blockchain, and big data. This will benefit users, who expect fast and reliable services also in these fields." The EPO's co-operation with the Chinese patent office dates back more than 30 years to the signing of a first memorandum of understanding between the two patent offices in 1985. The co-operation has contributed significantly to the modernisation of the patent system in China, and to improving the patent system at international level. For Europe, it has made available the rapidly growing amount of Chinese patent data, and has improved access to patent protection in China for European companies doing business there. CNIPA received more than 1.3 million applications for invention patents in 2017. China is now the fifth most active country of origin for European patent applications, with strong growth from Chinese applicants at the EPO in recent years (+17% in 2017). For the first time last year, a Chinese company, Huawei, became the top applicant at the EPO. Following a reform of China's IP agencies, SIPO was recently renamed CNIPA, and in addition to patents, utility models and designs, the office now also processes applications for trade marks and geographical indications.